MOTU upholds the Traveler's fine reputation with this solid update. Quality input stage and converters. Excellent V-Limit feature. Powerful CueMix system. New analysis tools. Front-panel screen is fiddly. Less features at higher sample rates. No reverb presets. Making music on the move can mean anything from laptop-based editing to full-on recording on location, and the gear designed for mobile use varies considerably because of this. MOTU's Traveler interface has always sat firmly in the recording camp, and the unit we're looking at here is the third in the series. It's compact and lightweight, with various powering options (PSU, FireWire, battery) and cross-platform support for all typical drivers (WDM/ASIO/CoreAudio/WaveRT). As such, you can be sure that it'll work with most software. It can operate as a standalone mic preamp, too. MOTU's interface handles eight channels of analogue in/out at up to 192kHz. Four inputs are combo mic/line/instrument connections, with the others at line-level only. There are also eight standard TRS outs. These are joined by ADAT (16 channels), S/PDIF and AES/EBU, all capable of 96kHz operation (note that MOTU has ditched the ADAT Sync option in favour of two banks of ADAT Lightpipe). Factoring in the headphone output and operating at 44.1/48kHz, that's 28 inputs and 30 outputs. At higher sample rates, and when using S/MUX for the 96kHz ADAT, channel counts are reduced accordingly. The Traveler-mk3 is of a software-controlled hardware design, using push-and-turn rotary encoders. With the LED screen, you can operate it solely from the front panel, although you'll probably find it easier using the CueMix FX software. "With the LED screen, you can operate Traveler solely from the front panel, although you'll probably find it easier using the CueMix FX software." CueMix FX is a cornerstone of MOTU's interfaces, and controls the unit's own DSP chips and powers the digital mixer. It provides 28 inputs, eight stereo busses, plus internal audio routing and effects. With up to eight potential submixes, setting up zero-latency headphone mixes is easy and flexible. But you've also got the benefit of a few built-in effects, including 7-band EQ, compression, limiting and reverb. The EQ and dynamics are hardwired to both inputs and outputs, so that you can process your mics at source. By contrast, the reverb is a global send/return effect. Beyond this, CueMix FX links in with other aspects of the Traveler's input stages. So, you get control over input trim, phase reverse, pad, V-Limit and Soft Clip. In fact, it seems that the only thing CueMix FX can't control by itself is the phantom power, which requires a physical switch on the unit's front panel. Inevitably, the mk3 has the edge over previous incarnations. Firstly, the input stage has better converters - high-impedance instrument ins and digital trim on all inputs (in 1dB increments), plus the new V-Limit hardware limiter and Soft Clip options. There are also a few analysis additions to CueMix FX, including Spectrogram and FFT views for the EQ, and overall oscilloscope, X/Y Plot and phase analysis windows. 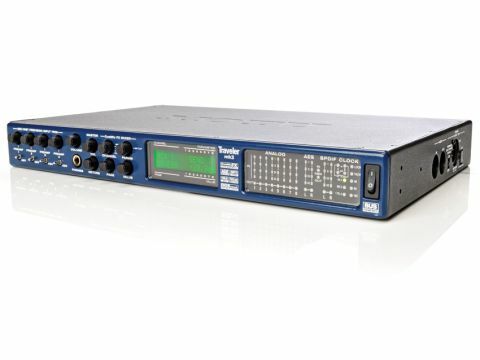 The Traveler-mk3 delivers enormous flexibility and for the most part is simple to use. The V-Limit technology is impressive, rendering ridiculously overloaded signals useable, especially with the lookahead feature engaged. The onboard EQ and dynamics are also precise. If you need to synchronise machines, the unit slaves to both LTC and MTC. Even so, there are a few curve balls. For example, the MIDI and power connectors are around the side of the case; modifying CueMix settings from the front panel screen can be fiddly; and, as mentioned, higher sample rates eat into your channel count and will also disable the reverb effect. Still, these are points to be aware of rather than real shortcomings, and very few units in this price range offer such an impressive feature-set. All told, the Traveler is guaranteed a safe onward journey.